Albuquerque, New Mexico. 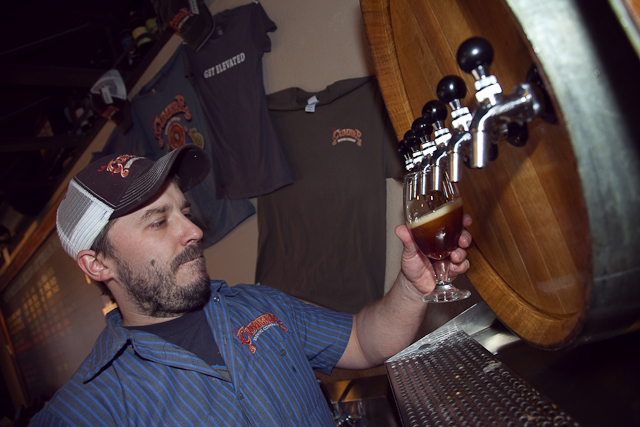 I’ve been a fan of craft beer for years, so I was looking forward to photographing a brewer at my earliest opportunity. In the first season of Dirty Jobs we paid a visit to Long Trail Brewing company in Vermont, and having dabbled in home brewing enough to appreciate the process, I hoped to spend time with a brewer I was a fan of. Jeff Erway is that guy. After nearly a decade of driving between the airport in Albuquerque and my home in Taos, I’d come to appreciate a local establishment by the name of the Chama River Brewing Company for their exceptional beers. I saw fit to join their brew club, which gives a discount on the refilling of growlers (half gallon glass jugs that provides an alternative to store bought beer), and allows you to enjoy your favorite beers at home. Long impressed with CRBC’s quality and consistency, in late 2009 I introduce myself to their head brewer at a craft brewfest at Taos Ski Valley. At that time Jeff was the man, though it was rumored that he would be leaving the company to pursue his own enterprise. 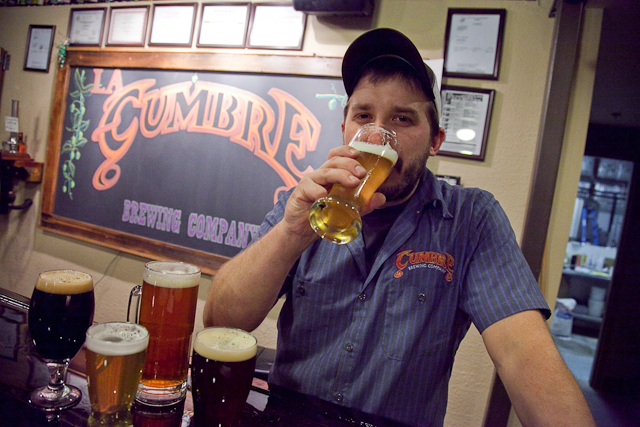 I remember feeling a particular disappointment, but over a year later, La Cumbre Brewing Company is the result. It’s mid morning when I arrive at the brewery, and Jeff is running around a large, empty space that resembles a warehouse. As I set up my camera, Bruce Springsteen’s recording of Pete Seeger covers fills the cavernous space with gritty Americana. In his work clothes, Jeff looks more the old school gas station attendant than entrepreneur, especially with the sweat glistening on his face. Camera now ready, I catch up to him as he heads to a closet-sized room in the corner, where he is loading bags of German malt into a hopper which transports the powder to a massive kettle in the main room. Emptying the bags is interspersed with jogging to the kettle to monitor the mixing of malt and barley. As he monitors the mixture, he regulates the temperature of the kettle. Then it’s back to the hopper for another bag of malt, stealing a swig of coffee en route. I’m aware that at least one brewing company in New Mexico has made the transition from on-site brewery-restaurant to distributing brewery: Marble Brewing Company. 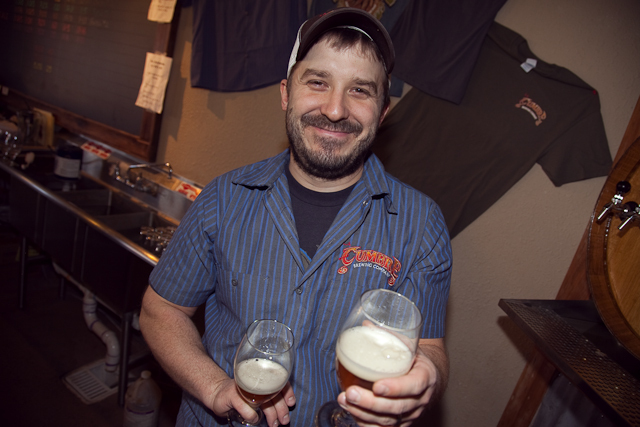 Their current Director of Brewery Operations, Tim Rice, taught Jeff the ropes when he was head brewer at Chama and Jeff was his apprentice. 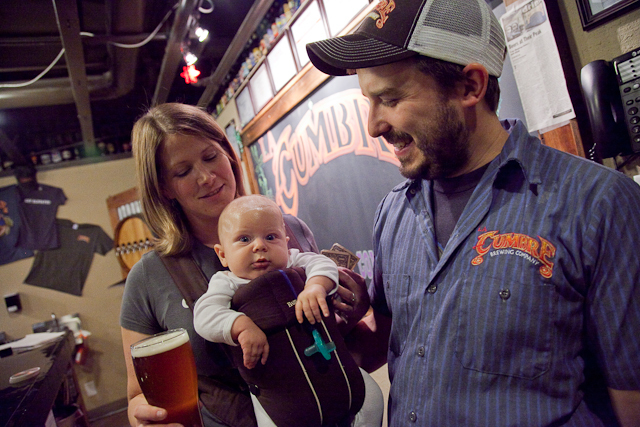 Several years later, their respective successes have fostered an evolution in regional brewing. In this writer’s opinion, Marble makes exceptional beer. With bottles now available in local grocery stores and tap offerings becoming ubiquitous in better restaurants, I am not the only one who believes this. It is this dynamic that I come back to throughout the day: Jeff, a young entrepreneur, seems an upstart competitor to not only the company that gave him an opportunity, but to the master brewer who gave him his knowledge and ethic. How does that fly? Apparently Jeff has a reputation as someone who helps others. During the course of the afternoon, a couple of inspired individuals pay the brewery a visit to discuss logistical requirements of their own speculative breweries, such as building codes, water and gas lines, and sewer capacity. One guy has the MLS data for an industrial property not far away, and the floor plan looks great for a brewery. When Jeff inquires about the date of the last building code inspection, explaining that a particular code certification is required for buildings of certain age and the exorbitant costs associated with upgrades should they be required, the gentlemen scrawls notes and backpedals out the front door. Jeff’s wife and partner, Laura, is on-site with their baby, Miles. Laura is managing the books, and has opened the front of the house for the day’s customers. As our acquaintance grows throughout the day (with my periodic visits to the front taps to research the product), it is clear to me that the establishment exudes a friendliness not unlike the family that owns and operates this space. 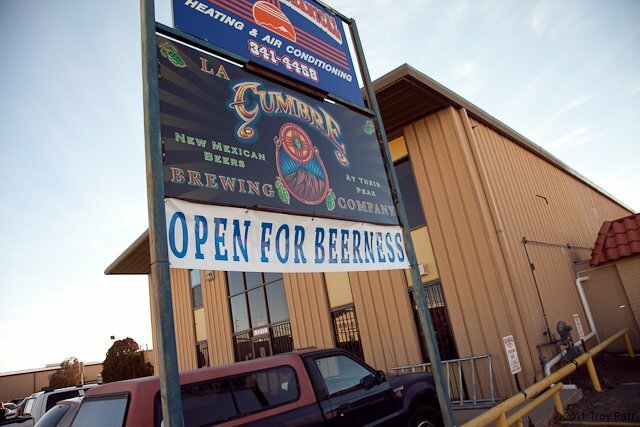 And, as evidenced by the number of casual visits to the back (for a friendly shout out to Jeff ), the customers at La Cumbre are an extension of that family. By the end of the day, after Jeff’s hopping and secondary hopping of his batch of Elevated IPA (India Pale Ale), emptying of the mash and it’s donation to a local rancher for use as cattle feed, assisting a truck driver with an overheated engine, and finally a long session of copious cleaning (“Cleanliness is everything”), Jeff and I are able to enjoy a beer together. The front tap room is packed with happy patrons, and Laura is filling the growlers I so thoughtfully remembered to bring. The vibe is chatty and warm, and despite only a month’s being open, everyone seems to know each other. By the end of my pint I’ve met a beverage distributor delivery driver, a photographer, a Ferrari restorer, Laura’s brother and his scientist girlfriend, and a competitor brewmaster from a joint down the street. “I have a new favorite brewpub,” I say. 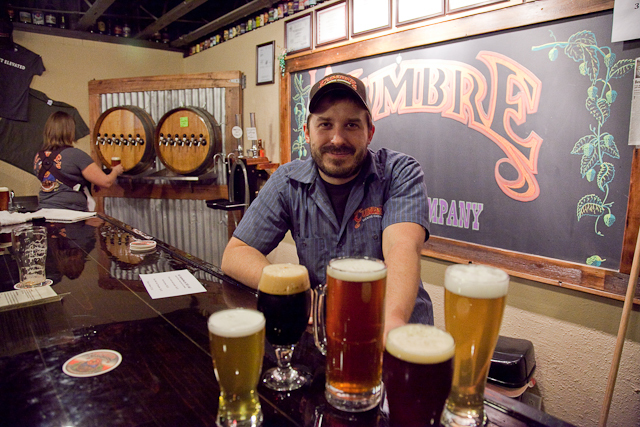 This entry was posted in Journal, Portraits, Tradesmen and tagged Albuquerque, brewer, craft beer, Jeff Erway, La Cumbre Brewing Company, microbrewery, New Mexico. Bookmark the permalink. Great read. I need to find a way to try the beers from his new venture. 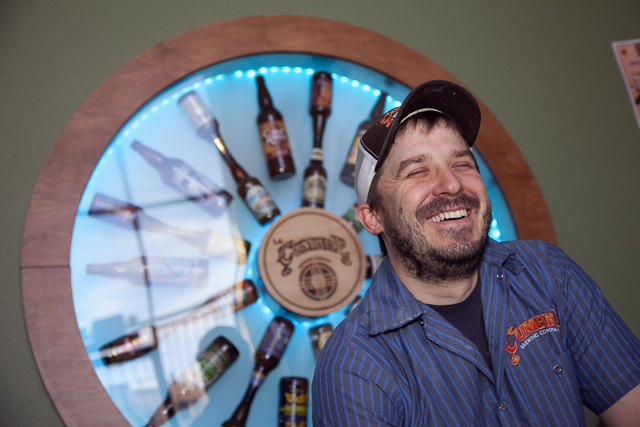 One cool thing about Jeff is that he loves to sharing his extensive brewing knowledge with others. I have sent him messages via Ratebeer.com asking questions, and he was always happy to reply with enthusiasm. Even when he went professional. The guy loves the craft of brewing. Troy, I realize you’re an expert photographer (so this will sound foolish to say), but I’m absolutely blown away by your ability to capture such amazing close ups of the tradesmen. I realize it’s probably due to the enormous amount of trust you instill—but, truly, I cannot detect even a hint of reserve in them. It’s refreshing to see photos that are so “unaffected” and real. I liked this story—and although I’ve never been much of a beer drinker, I could see working on my “openness to beerness” a little more now! Your pictures make me smile Troy. I viewed them again just now as a slide show. There is always such a defined subject in them despite whatever is going on in the background. My eye is drawn right to it, and then I explore what is going on behind. Jeff and Laura are risk takers, have done their homework, and are making a good go at their dream. I wish them much success. Thanks for showing them to us.